T H E S T U D I O is an urban minded full service salon for men and women where our clients mean everything. T H E S T U D I O researches and tests all brands before adding them to our exceptional line of retail products. Each product line makes a dramatic impact on the integrity of the hair, adds longer life to your hair color and helps to thicken and strengthen fine hair. UNITE from the Netherlands, Redken 5th Avenue, dermalogica skin care, Inner Sense all natural, all organic, Bureau #4...try it once and you will never switch. Redken For Men, Mineral Makeup New York and various miscellaneous items too numerous to mention. We offer the latest in fashion forward services to suit your individual needs. 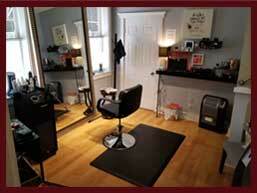 We feel that the most important service is your hair cut...for both men and women. We design your color selection based on our consultation. 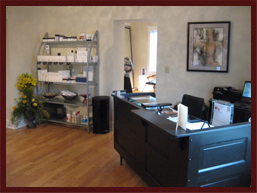 We have been doing Keratin Straightening Procedures since 2007...we are experts in the field. Our goal for you is Beautiful, Vibrant and Healthy Hair. You will leave with a new attitude and air of confidence. 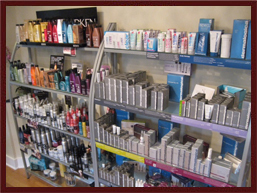 The Studio is your local exclusive distributor for the finest in cosmetics lines, including Mineral-Mine Cosmetics, NYC, Blinc Cosmetics, and Gerda Spillmann Corrective Foundation. Our beauticians enhance your natural gifts with makeup applications for weddings, proms, and special occasions. Our stylists provide services from false eyelash applications to full makeovers, and offer makeup lessons so you can do the same special effects at home. Talk with us about the right cosmetic brushes and applicators that you can purchase right here at The Studio for all your makeup application needs. © The Studio. All Rights Reserved.